Want a prank to trick a friend into thinking that Microsoft is out to get them for pirated software (whether rightly or wrongly)? Setup a startup message on Windows with this simple adjustment and watch your victim panic on the next startup. This may not work on a professional who works to maintain Windows OSes for a living, though. 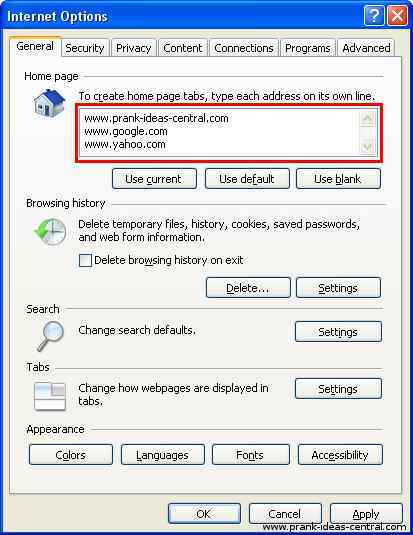 For Windows XP and above (even Windows 98, it seems): To make this Windows prank work, do the following steps. Open REGEDIT. You can do so by clicking on "Start->Run...", and then typing in "regedit" and clicking "OK". Navigate to HKEY_LOCAL_MACHINE/SOFTWARE/Microsoft/WindowsNT/CurrentVersion/Winlogon. Edit the key 'legalnoticecaption' (highlighted in red) with the name you wish to call the Window the message pops up in. I'd suggest something along the lines of "Illegal copy of Windows XP Detected". 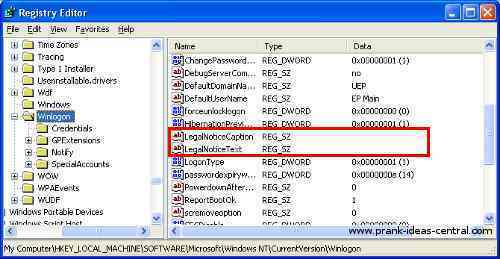 Edit the key 'legalnoticetext' (also highlighted in red) with the test you want to put in the message window. Perhaps "Please uninstall this copy of Windows XP or legalize it within 6 hours, or legal action will be taken against you.". On the next restart, you'll get a notice before you even reach the Welcome screen. Please stop your victim from actually deleting their copy of Windows or swamping tech support when they get hit by this prank :). In all modern web browsers, you can set 1 or more website addresses to open when you start the browser, or click on the homepage button. If you add more addresses, more tabs open up. I used to get mine set to www.pig.com. Here are the instructions to change the default page setup for some of the major web browsers available today. Internet Explorer: Go to "Tools->Internet Options->General". Under the homepage subcategory, type in the webpages you want to open by default, separated by using the "Enter" key, then click "OK". In the configuration shown above, 1 tab will open up for each web address, so a total of 3 will open every time you start up IE or click on the home button. Mozilla Firefox: Go to "Tools->Options->Main". In the Startup Category, change the "Home Page" field to whatever website you wish to open, then click "OK". Google Chrome: Click on the button which looks like a tool and select "Options". In the "Basics" tab, under the "On startup subsection", click on the "Open the following pages:" radio button. Click "Add" and type in the web address you want to set as the default page. Add more if you wish, then click "OK". I've already been fallen several times for this Windows prank set up by my brother. Serves me right for leaving my computer unattended! You can put in any shocking or embarassing website you wish in an unattended account, and I do mean ANY! However, please keep the website addresses legal for your victim's sake, at least. As an afterthought, try adding 20 default homepages for browsers that allow you to open multiple tabs :). Imagine your desktop icons without all the words underneath it. Elegant or bewildering? That really depends on the individual. In the hopes that it freaks your victim out, here's how to remove all the words. Right-click on the target shortcut, and click "Rename". Then hold down the Alt key and type in 255 on the keypad to the right of the keyboard. Make sure the Num Lock key on your keyboard is on. You can’t use the number keys right above the keyboard, they won’t work. For the first shortcut on the desktop, a simple Alt+255 will do. For the next shortcut, you’ll have to enter the combination twice (Alt+255, Alt+255). For the third, 3 times… you get the idea. This works because the Alt+255 character is a blank, so the shortcut is just named with a blank character. Since you can’t have two shortcuts named the exact same thing, the second shortcut will have to be named with two blank characters, and so on. This Windows prank will work on Windows XP, Windows Vista and Windows 7.